Direction Turquiose went blue at ends nd green on rest of my slice. nd then it just faded green it was lovely nrly out now. got a hint of it left :3. MP Vampire Red goes orange very quickly (within a week-10 days for me). SFX Candy Apple Red faded to a hot pink shade, but took about 4 weeks to get to a noticeable pink rather than red. Trying Hot Lava tomorrow which is more orangey so suspect that'll fade out in a few weeks similarly..
~I've been put upon this earth in female form. Manic panick wildfire red: Orange-pink. Way more orange than pink, but personally i think i saw a little pink in there. I put mine on top of bleached hair with white toner, not sure if that makes it look that way when it fades??? Dark Purpley blue (very transfery) > bright blue > light blue. Best lasting/nicest fading blue I've used. Catches the light amazingly. 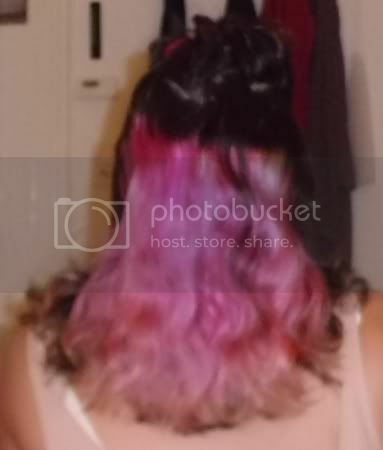 Bright pink/magenta > pink > orangey pink/baby pink depending on hair underneath. Navy (very transfery) > royal blue > Teal> mucky turquoise. Very fast in my case. I would love a blue that actually fades to baby blue! Unfortunately I don't believe Directions is available where I live. Someone here on the boards said that Directions is called Punky Colours (which is available in my area) overseas, but alas I can't find Neon Blue at the store or on their website. Rats! To get the blue to fade to a baby blue your hair needs to be the right base colour first. For example, it will have to be light enough that you could dye it baby blue fine. Stargazer Dawn - actually starts out orange and stays that way! I've just dyed over it after a few weeks of having it and it just faded to a pale orange. Sadly it faded quickly but the dregs stuck around all this time! Rose Red (over an orange base) started dark pink -> bright pink -> orange/pink/red, kinda like autumn leaves, i loved it! Can anyone tell me how long the Hi-octane orange lasts and what it fades to? I couldnt spot it in the different lists. Im trying to decide whether to go Napalm Orange or Hi-octane. From what I can see Napalm lasts a fair time and fades to yellow. Napalm does fade to a golden yellow colour, mine's doing that very slightly after several weeks of hanging around. It certainly has staying power! I can't say for Hi-Octane coz I've never used it but Napalm is awesome. How often do you wash your hair? Do u do anything special to help the dye last? I generally wash my hair about twice a week. Because I have dreads I wash my hair once a month, if that and I use a very colour stripping shampoo because it's good for my dreads. So far I've washed my hair three times since I dyed it and there's very little, if any colour loss. ...Ultra Violet- fades to blue, then old-lady gray. Crazy Color Fire > It didn't really fade on me, just went a bit darker but once topped up with half a bottle it goes back bright again. hi! quick question coz i don't want to start a new thread - MP Enchanted Forest, does it fade minty? like this colour/bit paler? would it work mixing it with toner? I'm just a bit worried about purple toner + green dye = odd brown. Do you mean the Ebony one? Or a different one I've not seen? I'm going to dye my hair that shade I think so would be good to know! Are there any that are blue based? 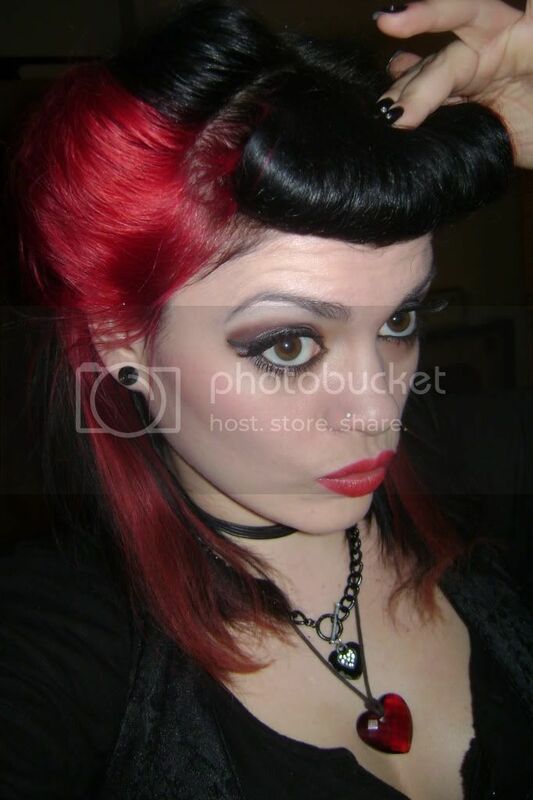 KittyCatWindow- (I might've spelt it wrong) but the Manic Panic colors you used oh man i got the same....lol@ the old lady grey....Yup....and its on my Student ID hahah! ignore my general facial area.